"Hominy Grill is housed in a three-story Charleston shotgun dwelling which was built in 1897. The ground floor of the building, which now houses the restaurant was originally a barbershop and still boasts the old-timey barber poles along with an original pounded tin ceiling and hardwood floors." Our waiter was perfect, the atmosphere cozy and we both ate every last bite of every dish that was served! The salad with currants, pumpkin and sunflower seeds had the most incredible dressing! I ordered the "Sesame-crusted catfish with sauteed okra, deep fried cheese grits & geechee peanut sauce" and it was pure heaven! Jon started with an amazing "chipotle sweet potato soup" and then "Shrimp & Grits: Sauteed shrimp with mushrooms, scallions & bacon served over cheese grits" and was equally impressed. Then we had a perfect piece of pecan pie with handmade whipped cream and I could have just dropped dead right then, gone out happy with the perfect Southern dinner! People think these kind of real Southern restaurants abound down around here-but they really don't! 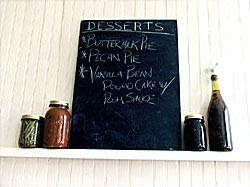 In Savannah we used to delight in a similar restaurant "Sweet Pototoes" on Waters Street- make the trip if you haven't. Its not in the greatest area-but their biscuits melt in your mouth! Both restaurants have websites-so check them out if you plan on being in the area-and please have a slice of pie for me!